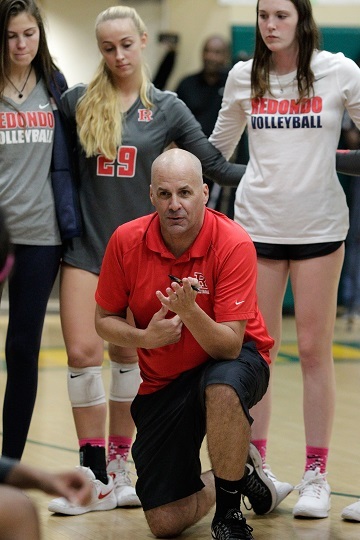 Redondo’s girls volleyball team hopes to shake off the dust when it begins its run for a State Championship this week after a second lengthy layoff from match play. Following their defeat of Mira Costa to capture the Bay League title on October 10, the Sea Hawks were forced to wait eight days before its first playoff match. After Redondo (34-3) fell to Marymount 3-1 in the CIF-Southern Section Open Division semifinals on October 27, the Sea Hawks will resume action following an 11-day layoff with a home contest against Cathedral Catholic of San Diego (28-7) in the first round of the State Open Division Southern Regional Bracket on Wednesday at 7 p.m.
“The layoff was difficult at best,” Redondo coach Tommy Chaffins said. “Volleyball is such a rhythm game. We have played only four times in 28 days due to poor planning from the different CIF entities. With that being said, we are glad to be playing. We will have to overcome top teams in the nation, not to mention the rust that builds when your not constantly playing. We say we like difficult challenges, and we have many challenges in front of us, just the way we like it. “Cathedral Catholic has a 6-foot-4 opposite hitter going to USC, a 6-1 opposite going to Nebraska who had 25 kills in the San Diego Section final, and another stud going to Notre Dame,” Chaffins said. “They are physically as big as any team in the country. They also have an advantage of having played three times last week, while we haven’t played in 11 days. The winner will likely face top-seeded Mater Dei (39-2), the CIF-Southern Section champion, in the semifinals on Saturday. Mater Dei hosted No. 8 Long Beach Poly (30-8) in the first round. Other first-round matches in the Southern bracket are No. 2 Torrey Pines (32-3, San Diego Section) versus No. 7 San Juan Hills (17-8, Southern Section) and Southern Section representatives No. 3 Marymount (31-9) hosting No. 6 Sierra Canyon (33-10). The Southern California championship takes place on Tuesday, Nov. 13. The State championship pitting the Northern and Southern Regional winners will be held on Saturday, Nov. 17 at Santiago Canyon College in Orange. Competing in the Northern Regional are (by rankings) Sacred Heart Cathedral Prep. (30-6), Buchanan (33-7), Marin Catholic (36-3), James Logan (32-7), Central (36-5), St. Ignatius (27-14), Palo Alto (24-5) and Ponderosa (31-2).